One of the emerging technologies in the world of micromachining is that of the usage of short and ultrashort laser pulses. Many manufacturing industries have been revolutionized by the employability of laser beam micromachining (LBMM) process for a number of micro-engineering applications. Short and ultrashort laser pulses houses tremendous amount of thermal energy that can be used for the fabrication of micro-features using a wide range of engineering materials. 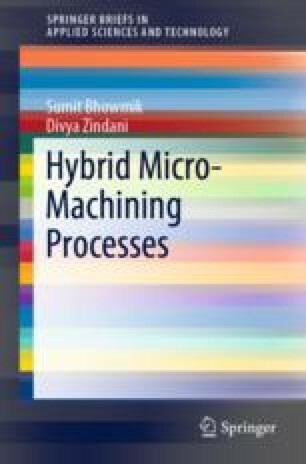 To further extend the capability of the process, the laser is integrated with other standalone micromachining processes such as micro-milling, micro-grinding, electrochemical micromachining, water jet micromachining, etc., and giving rise to hybrid micromachining setup in the form of laser-assisted micromachining process. This chapter begins with a short introduction on laser beam machining. Laser beam micromachining has been discussed next in the subsequent section. The next section elucidates on few applications of the laser-assisted micromachining process. The chapter finally terminates with the concluding remarks.